Policy pain points continue to kill blue-collar jobs in Illinois. A yet-to-be-named Illinois manufacturer (Update, August 18: now identified as Hoist Lifttruck) is planning to move from the west Chicago suburbs to East Chicago, Indiana, according to a July 6 report in the Northwest Indiana Times. The company will move 510 jobs to its new Indiana plant, where workers will be paid an average of $55,000 per year. The company plans to make a major $50 million investment in East Chicago, Indiana, including $16 million to buy property, $15 million to install new operating equipment, and $8 million to renovate the space, which will result in additional construction jobs. The unnamed company is joining a stream of Illinois manufacturers who are crossing the border and creating thousands of blue-collar manufacturing opportunities in Indiana. Recent exits from Illinois include T & B Tube, AM Manufacturing, Modern Drop Forge, Edsal Manufacturing, American Stair and Granite City Steel, with many of the companies directly commenting on the better business climate offered in Indiana. It’s no surprise that the company will take higher-paying jobs out of Illinois. In fact, for blue-collar jobs, workers get a better deal in Indiana than in Illinois. The average pay for Indiana manufacturing workers is $2,300 per year higher than manufacturing workers in Illinois, according to data from the Bureau of Labor Statistics. 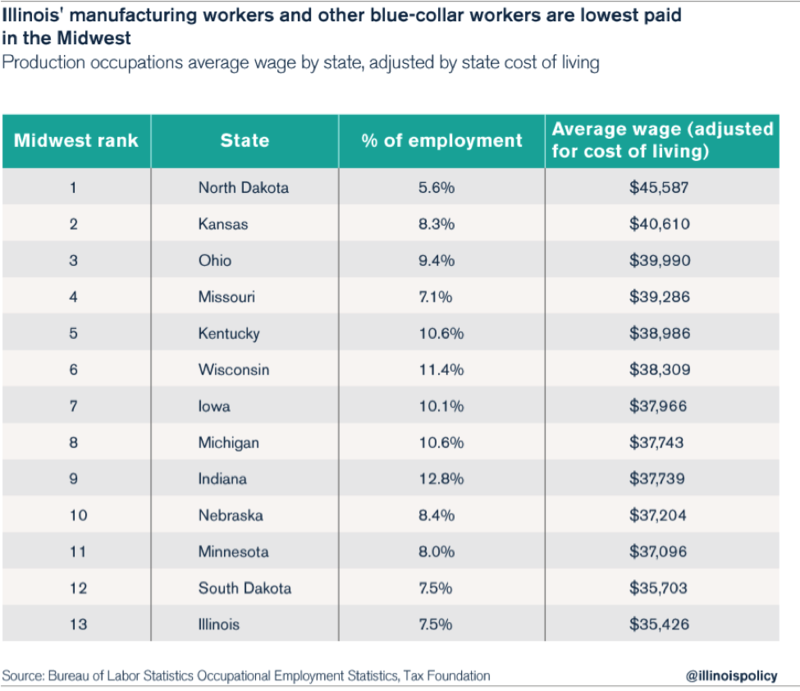 Illinois’ manufacturing workers take home the lowest pay in the Midwest. It’s easy to see why manufacturers are leaving, and taking good-paying jobs with them. Take, for example, the difference in regulatory costs between Illinois and Indiana for workers’ compensation. With 510 jobs at an average wage of $55,000 per year, the unnamed company leaving Illinois will have a total payroll of $28 million per year. Moving to Indiana will save the business $1 million to $2.8 million annually in workers’ compensation costs alone, depending on its industry. Another issue is worker freedom, where Indiana once again beats out Illinois. Indiana passed a statewide Right-to-Work law in the spring of 2012, with the goal of gaining more manufacturing jobs. The policy plan makes sense, according to CNBC polling of chief financial officers across the country. Two-thirds of the CFOs said they consider a Right-to-Work law to be an “important” or “very important” factor when deciding where to locate and expand. 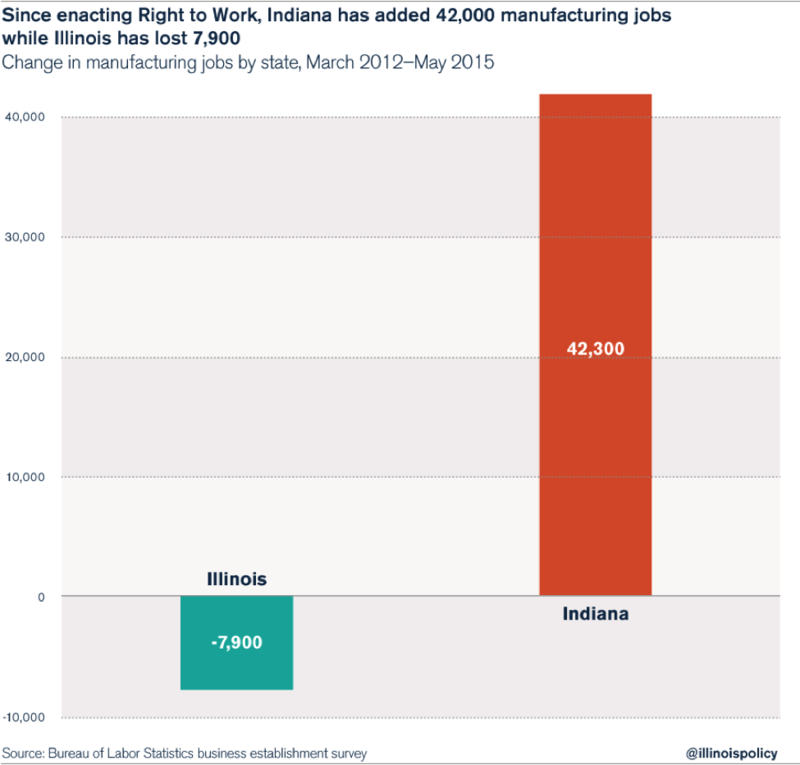 The policy change has helped Indiana generate good manufacturing jobs. Since enacting Right to Work, Indiana has gained 42,300 new manufacturing jobs, while Illinois has lost 7,900 manufacturing jobs in the same time period. Union Electric plans to hire 35 more employees in Valparaiso, Indiana, as a part of its plan to expand in the Hoosier State. 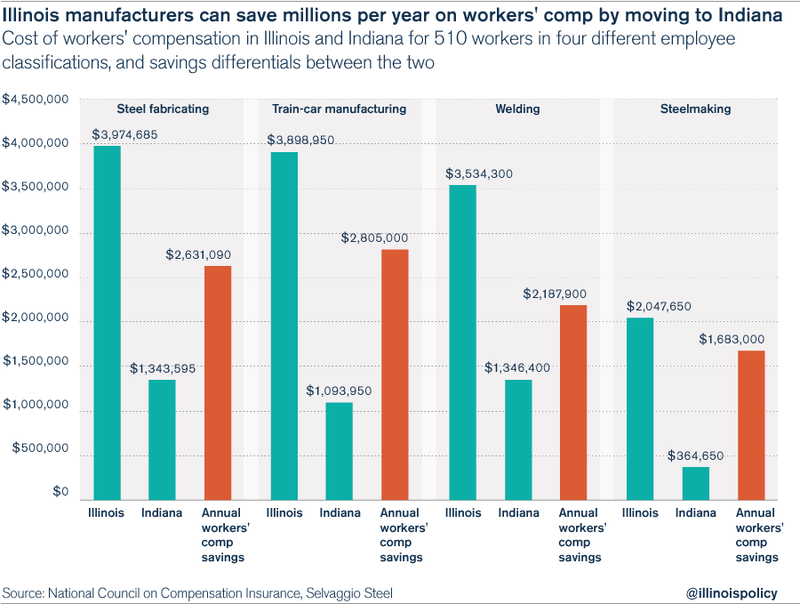 Illinois’ anti-growth regulations on workers’ compensation and worker freedom are two policy pain points that have manufacturers heading elsewhere. Reforms to cap property taxes and reduce unemployment-insurance costs would provide additional relief for manufacturers looking at where to grow their futures. But without reform, Illinois faces a future of continued exodus for well-paying, blue-collar jobs.